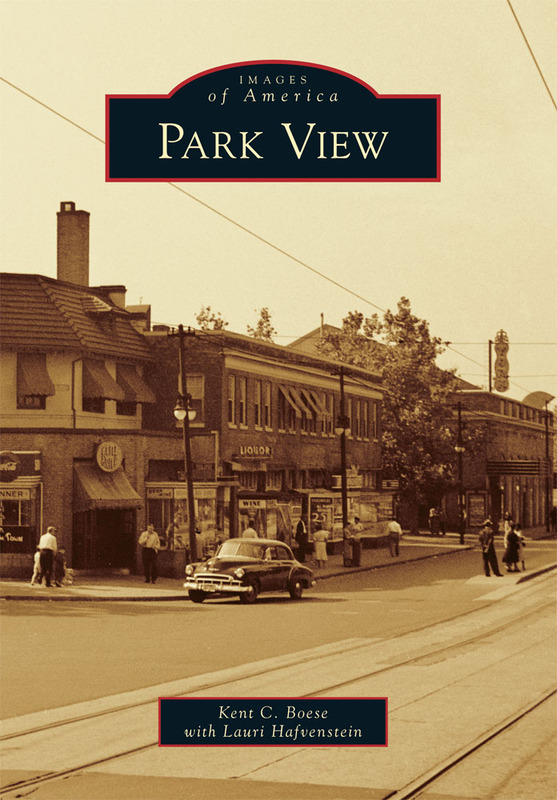 The renovations at 3661 Georgia Avenue are complete, and Park View now has another option for coffee. 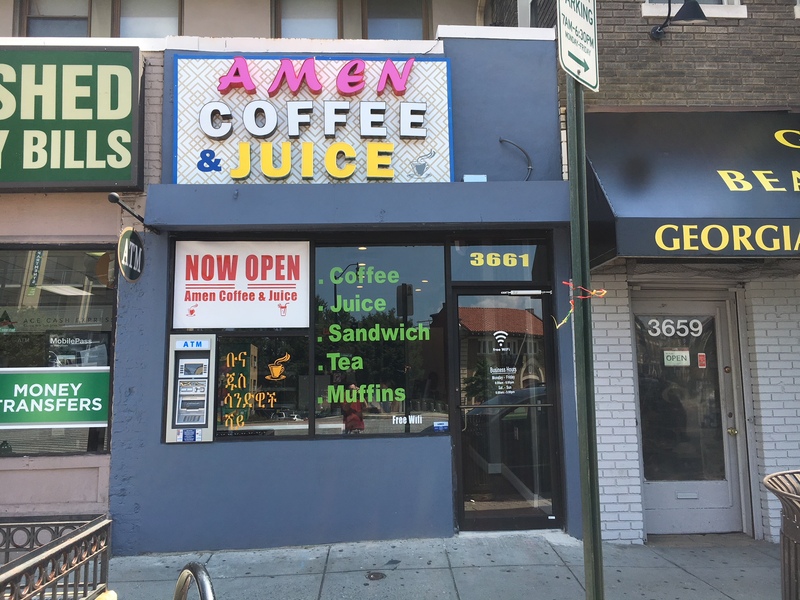 Amen Coffee & Juice recently opened in the neighborhood and is located between Ace Check Cashing and Reliable Tavern, just south of the Georgia Avenue Metro. I haven’t had a chance to check it out yet, but look forward to doing so soon. Kraken Axes is located in the former Murray’s at 3400 Georgia Avenue. Kraken Axes hasn’t even gotten into full swing and it appears that trouble is already brewing. 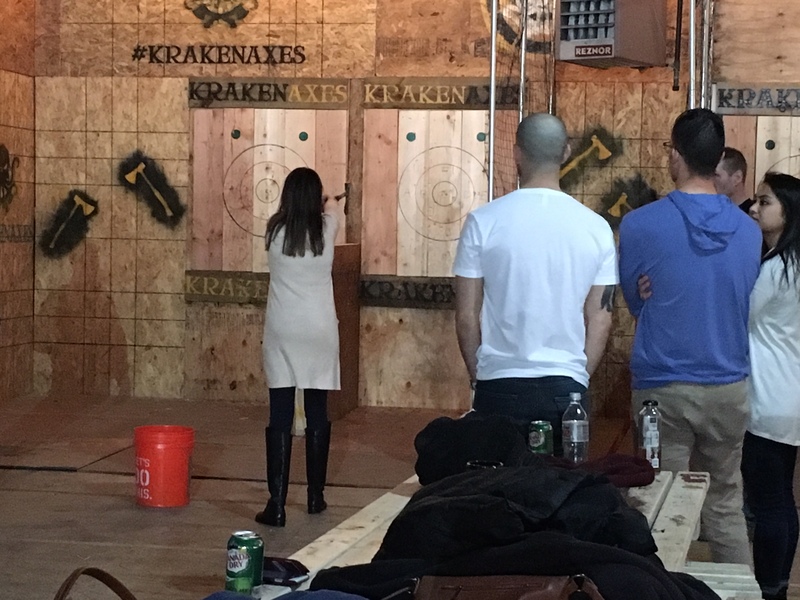 Kraken Axes opened in mid-December 2017 and is centered on the the sport of axe throwing in which the competitors throw an axe at a target, attempting to hit the bulls eye as near as possible, much like darts, but with axes. 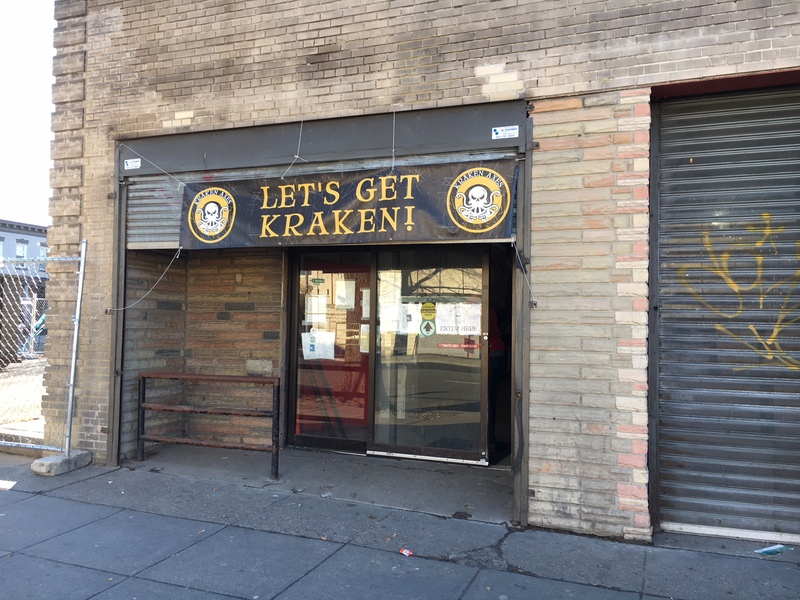 In April, Kraken applied for a license to serve alcohol, both inside the establishment and on the parking lot, which they explained would be reconfigured as a Summer Garden. 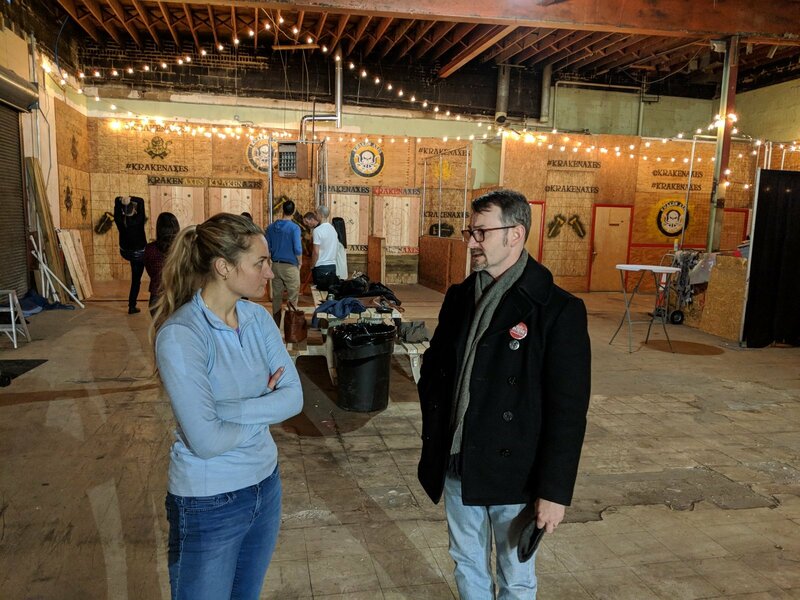 This drew a lot of concern from nearby neighbors leading to a negotiated Settlement Agreement with ANC1A which the Commission approved in May and the ABRA Board approved in June 2018. Unknown to the ANC or community at the time of negotiation, ABRA was investigating Kraken Axes following ecomplaints they had received, leading to a hearing on June 27th before the ABRA Board (transcript here). The ABRA Board issued an ORDER REQUIRING APPLICANT TO DEMONSTRATE FITNESS FOR LICENSURE UNDER§ 25-301 AND ORDER on August 1, 2018, as a result of June hearing (full order here). In that order, Kraken Axes and D.C. Field House (both operated by the same owners), are directed to appear before the ABRA Board to demonstrate their qualifications for licensure. The hearing is scheduled for August 15, 2018, at 1:30 p.m. at ABRA in the Reeves Building. COUNT I: Denial of the application filed by Kraken Axes is warranted where the Applicant allowed, permitted, or engaged in various violations of the law that merit denial of the application under 23 DCMR § 401.1. COUNT II: Denial of the application filed by D.C. Field House is warranted where the Applicant allowed, permitted, or engaged in various violations of the law that merit denial of the application under 23 DCMR § 401.1. COUNT III: The Board may deem the Applicant unfit for licensure pursuant to D.C. Official Code§§ 25-301(a)(l) and 25-301(a-1) based on the Applicant’s conduct, or if any of the violations identified above are sustained. The findings of fact are serious, indeed, and this is a case of great concern to ANC1A and the community. We’ll need to see the outcome of the August hearing to determine what, if any, next steps need to be taken. 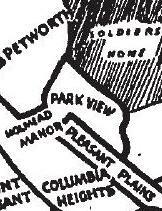 The Lower Georgia Avenue Main Streets is currently conducting a survey to identify community priorities, creating an opportunity for residents to engage. The survey is open until April 4th and can be found via SurveyMonkey at https://www.surveymonkey.com/r/765JZPB. The survey takes less than 5 minutes to complete. The purpose of the survey is to help the program better understand community priorities. Hard copies are available upon request. Everyone is encouraged to participate today and feel free to forward this invitation to others! The Lower Georgia Avenue Main Street is a new community-based economic development program to support small businesses and neighborhoods along the Georgia Avenue corridor from Kansas Avenue to Barry Place. Georgia Ave Thrive partnered with District Bridges in applying for this grant, awarded Fall 2017 by DC’s Department of Small and Local Businesses. More info is available on the District Bridges website at districtbridges.org. 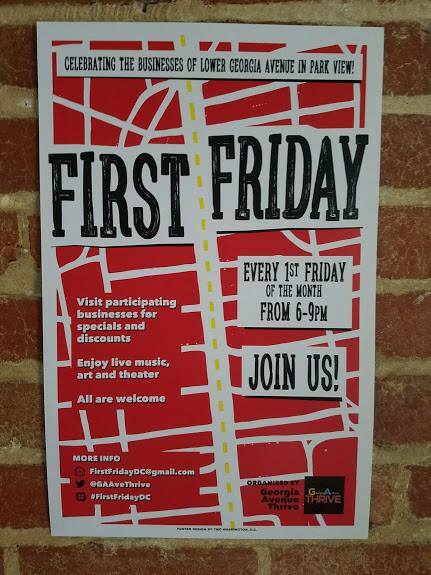 Tomorrow is the next First Friday on Georgia Avenue, from 6 pm – 9 pm. First Friday’s celebrate the small businesses in our neighborhood and allow neighbors to enjoy all they have to offer from food and drink specials to books, yoga, etc., fun and live music and art. For the list of participating businesses check here and look for the First Friday posters in store windows. Also, on Friday look for First Friday chalk marks in front of participating businesses. This month, there are a few “special events” for Friday worth highlighting and a kid friendly activity all around the “theme” for Green Spaces including green spaces for dogs. Green spaces are an important part of our lives and DC neighborhoods and they contribute to our health and well being. DC documentary film makers Meridian Hill Pictures (meridianhillpictures.com) will showcase a story about green spaces, community and the efforts of DC’s “Washington Parks and People” (washingtonparks.net) in their documentary “City of Trees” (cityoftreesfilm.com). Meridian Hill Pictures is making the film available for a free community screening during First Friday. Come to Colony Club (www.colonyclub.com) at 3118 Georgia Ave NW, the film will start at around 7:30pm. Washington Parks and People will join the community for the event. An example of the wide range of use of our green spaces will be a an installation by Noa Heyne (https://www.noa-heyne.com/) at the Bruce Monroe Site as part of CulturalDC’s “SPACE4: Mobile Art Gallery”. Take a sneak peak from 5-7 pm on Friday before its official opening on Saturday. Thanks to District Bridges for making that connection. With so much available on Friday night, there’s no need to stay home. Come out and have a great time! Gee’s Market at Warder and Otis, NW. 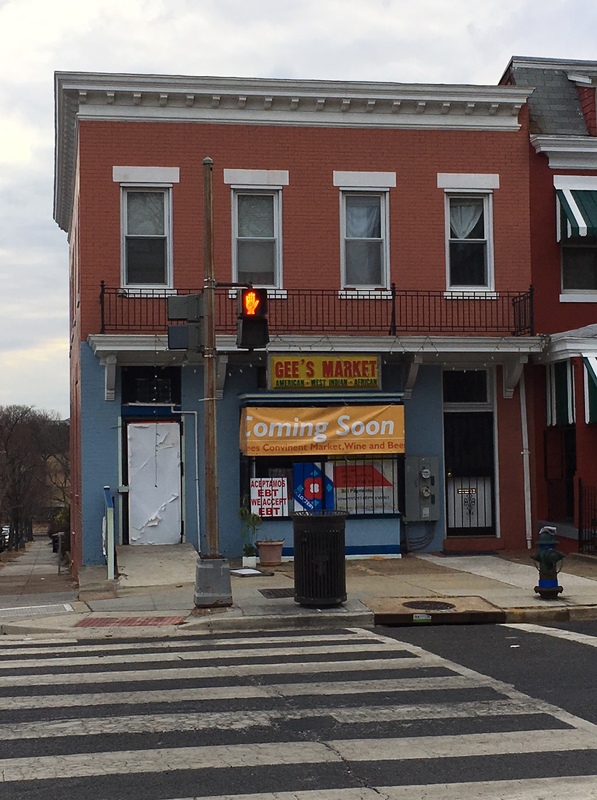 Gee’s Market, at Warder Street and Otis Place, is currently undergoing renovations. 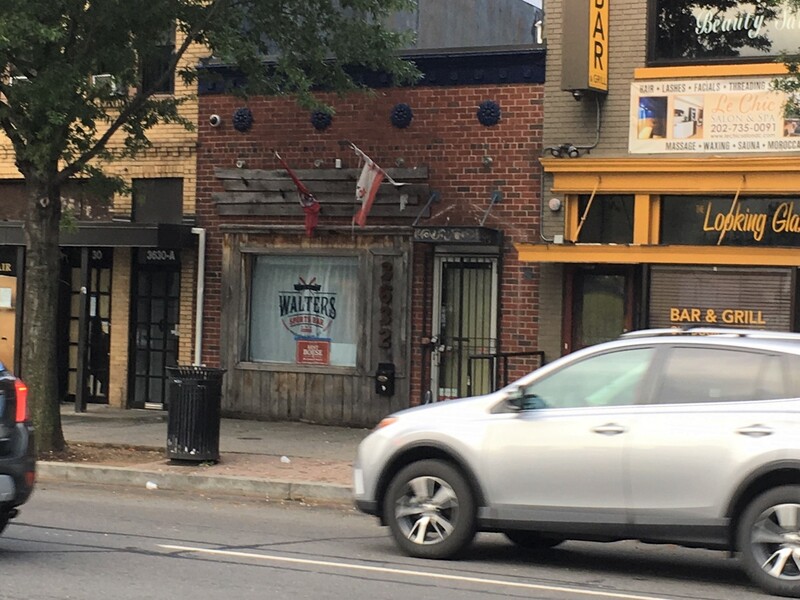 I had a chance to stop by last week, briefly chat with the owner, and peak inside. It was largely empty and it looks like the space is being reconfigured. It was too early to tell what the final result will be so I’ll be checking in again soon. I have received a few questions about the sign announcing “Coming Soon” and listing wine and beer. The “Coming Soon” refers to the renovations, not the wine and beer. Gee’s has had an ABRA license to sell beer and wine for many years, and during the last renewal process the ANC entered into a Settlement Agreement with Gee’s to address issues with the store that occurred in 2013 and earlier.